So far Wabasha-Kellogg Chamber & CVB has created 70 blog entries. St. Felix and Wabasha-Kellogg Elementary School are hosting a shoe drive from March 11th – April 24th. Help support our local schools and the Food For His Children foundation by donating your lightly used or new shoes to be used in developing nations for impoverished people to start their own businesses. The shoes can be dropped off at the St. Felix and Wabasha-Kellogg Elementary School Common Areas. Contact Eric Sonnek at 651-565-4446 or Danielle Lombardo at 651-565-3559 for more information. Help support St. Felix School with their Pot of Gold Cash Raffle Tickets! The tickets are $20.00 a piece and can be purchased at St. Felix School & Parish Offices, Paul Busch Auto Center, Hill’s Hardware Hank, Aileen Wagner at 651-564-0492, and Shelley Wingert at 507-251-3602. The drawing will be held on Friday March 15th at 12pm at the St. Felix Gym. A Motivator/Influencer in your community – someone who knows people and isn’t hesitant to talk to and meet new people. Human Resources, IT or Financial experience a big plus. Board members who live or work within Goodhue, Wabasha or Pierce Counties and are willing to come to Red Wing for 10 board meetings each year. All genders, races welcome to apply. Must be 18 years or older. People who already are passionate about helping others through the work of United Way or want to learn more. Make a $5 donation & you’ll receive 20% off Home Décor. Our new Easter & Spring décor is here with more arriving every week! Make a $20 donation & you’ll receive 20% off selected Amish furniture. The Woods will match all proceeds which will be given to our local food shelf…..Help us make March 2019 a record breaking month! Wabasha is your premier four-season recreation destination. Known for its extraordinary natural beauty, Wabasha is nestled between the rugged soaring limestone bluffs of southeastern Minnesota and the majestic Mississippi River. More than just a picturesque historic river town, Wabasha draws tourists from all over the world. Many activities take advantage of its unique location. Boaters enjoy the ever-changing river with its wide channel, quiet backwaters, and abundant sandbars perfect for picnics or overnight camping. If kayaks or canoes are more your style, the Mississippi and nearby Zumbro River offer scenic stretches filled with wildlife. Wabasha is home to the National Eagle Center, a world-renowned museum and interpretive center dedicated to eagles and other wildlife indigenous to the Upper Mississippi River watershed. Nearly half of all waterfowl use the Mississippi River flyway for migration or nesting. The National Eagle Center offers unmatched opportunities for viewing them as well as exhibits, field-trips, and programming. Experience it all in Wabasha-Kellogg! 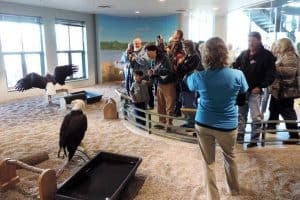 Located on the banks of the Mississippi River, the National Eagle Center offers live eagle programs daily, interactive exhibits and wild eagle viewing. Open year round. Check out our website for special events! Named “One of the Top 10 Best Toy Stores in the World!” by USA Today. Featuring original pull toys, hand-carved carousel, mini-golf, puzzles, games, toys, cafe, bookstore, llamas, toy museum, fudge and much more! Satisfy your sweet tooth! See the 70-foot-long “Origins of Chocolate” wall mural! Old fashioned candies and chocolates, ice cream and beverages. Stroll down the historic Wabasha downtown district and see a little piece of Minnesota history for yourself. Walk past the Historic Anderson Hotel and stroll by the beautiful red brick buildings that add a unique atmosphere to our river town. Arrive in Wabasha and check-in at your hotel, bed and breakfast, or campground. Head downtown and visit some of the boutiques around Main Street. Stop in Heritage Park for Music Under the Bridge – a summer favorite featuring a different musical group every Friday evening. Walk along the riverfront to Slippery’s for dinner at the iconic destination for all Grumpy Old Men Fans. Enjoy dinner inside or on the patio and take in the beautiful view of the bridge and Mississippi River. Start your morning off on the right foot with breakfast at Stacy’s Kitchen. Build your own breakfast skillet or indulge in a fresh baked cinnamon roll with cream cheese frosting if you’re feeling extravagant. Walk down the street to the National Eagle Center, your destination for everything eagles. Explore the museum and learn about the magnificent birds and history of eagles in our culture. Step out onto the observation deck and take in the breathtaking view of the Mississippi River, while trying to spot eagles in the wild. Stick around for the engaging live eagle program and meet eagles ‘nose-to-beak’ within the center. On Saturday, February 23rd at 2pm, Gene Pelowski will give a multimedia presentation on “Napoleon and the French Revolution” at Castlerock Museum in Alma, Wisconsin. The program will focus on the music and art from the era. Some of the musical pieces that will be integrated into historical events include La Marseillaise, Beethoven’s 3rd, 5th, and 9th, Wellington’s Victory, and Tchaikovsky’s 1812 Overture. The Age of Napoleon by Will Durant will be used as a guide. Gene Pelowski taught history at Winona Senior High School for over 35 years. He has also served as Winona’s State Representative in the MN House of Representatives since 1986. He currently teaches at Winona State University. Admission is $6 for adults and $4 for students. Museum members receive a 50% discount. Castlerock Museum will be open at 1pm for visitors that would like to see the exhibits beforehand. Seating is limited. Reservations are not required but appreciated. Contact the museum at 608-685-4231 or [email protected] for more details. Click Here to Learn More! The Chamber has partnered with several local organizations to present the Artists on Main program, a free creative placemaking workshop for local creative minds. This exciting workshop will be held on Thursday April 11th from 4:00pm – 7:30pm and offers the opportunity to be part of a unique artistic program within the Wabasha community! If you are eager to learn about local placemaking and art collaborations, we encourage you to register for the workshop! Artists must attend the workshop to eligible for the program. For more information, contact Mary Flicek, Wabasha Main Street Artists on Main Coordinator, at (651) 380-9035 or [email protected]. Eligibility You consider yourself an artist or creative. You live within a 15 mile radius of Wabasha You want to learn about placemaking Artists must take workshop to be eligible.